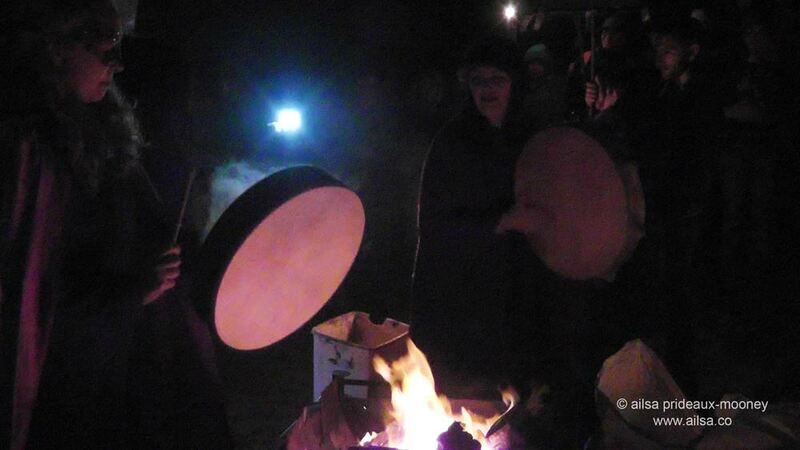 Echoing the Ancients in the Cradle of Samhain | Where's my backpack? The morning of October 31st started off grey and rainy and got stormier as the afternoon approached. I pressed my nose up against the window and watched as the clouds grew thicker and rain spilled down in sheets. It was the worst kind of weather, the kind that thwarts carefully hatched plans. This year I had decided to give the usual Hallowe’en fare of trick-or-treating and costume parties a miss in favour of something a little different. Ireland’s County Meath, sometimes referred to as the Royal County because it was once the seat of High Kings, is home to a wealth of historic sites. Popular destinations include the Hill of Tara and Newgrange but there are plenty of lesser-known treasures too, such as the Loughcrew Cairns. The place that was calling my name on All Hallows’ Eve was the ancient site of Tlachtga, known today as the Hill of Ward, just outside the town of Athboy. This barely-explored archaeological site is held by many to be the birthplace of Samhain and the origin of today’s Hallowe’en. In the swirling mists of ancient Ireland, this was believed to be a ‘thin place’; a spot where the veil between this world and the next grows thin, particularly around the time of Samhain. The monument itself consists of a circular central plateau surrounded by a beautiful series of concentric circular hills and ditches. 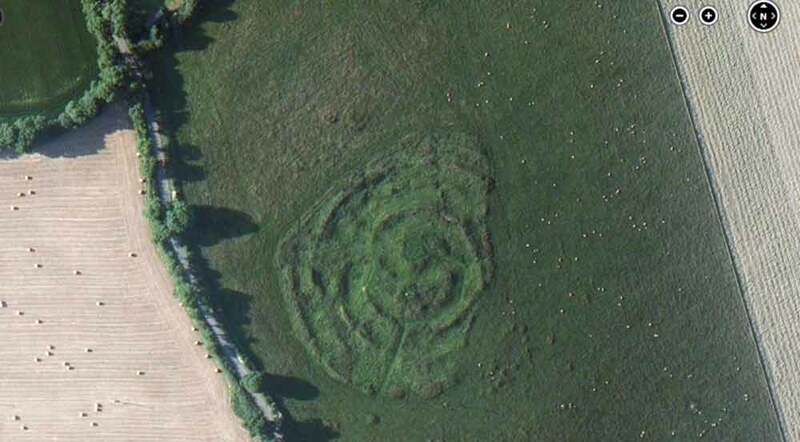 Aerial image of Tlachtga c/o Bing Maps. I’m not that tall and don’t have a helicopter. The complexity of the site suggests it was a place of great prestige in olden times. Whilst Bronze and Iron Age activities remain shrouded in mystery, historical records show Tlachtga endured in importance. The last High King of Ireland held a synod here in 1167, attended by thousands. In 1172 the King of Bréifne, Tigernán Ua Ruairc, travelled to Tlachtga to negotiate disputed territory with Norman Lord Hugh de Lacy, but found himself rudely separated from his head in a gruesome assassination. 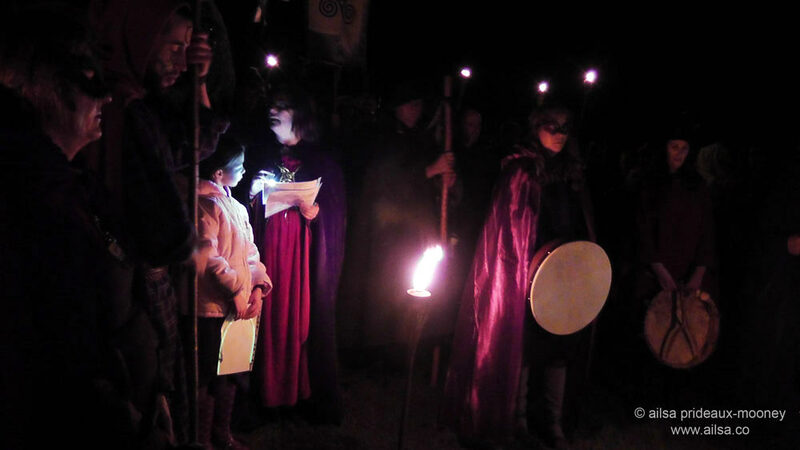 Over the years, however, Tlachtga’s significance faded and it was mostly forgotten about, until in recent times, local resident Joe Conlon decided to raise awareness with an annual Samhain Fire Festival. My windshield wipers were working overtime on the road north, but I was still holding out hope for a break in the downpour. Somewhere between Trim Castle and Athboy, without me even noticing, the rain abated. 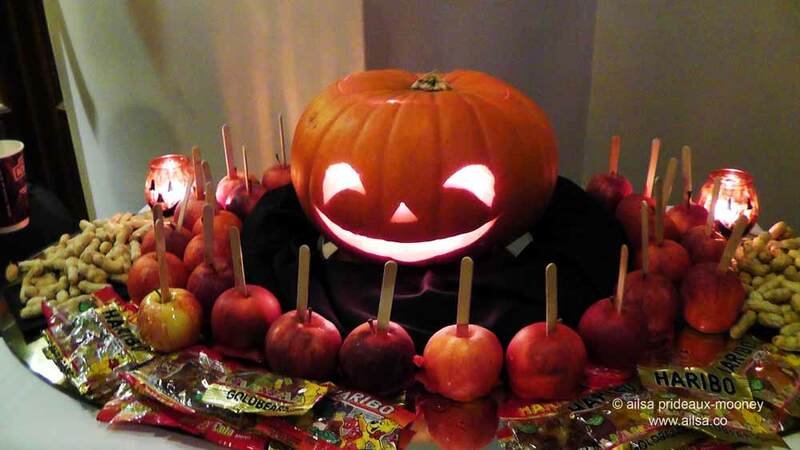 I made a quick pit stop at the Darnley Lodge Hotel on Athboy’s main street; they were serving up toffee apples for the kids and great big cups of pumpkin soup for the grown ups. 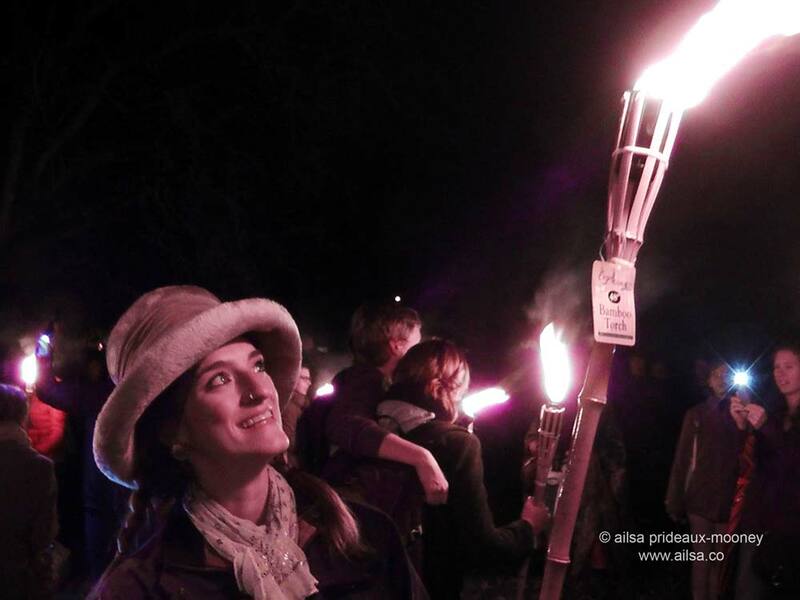 Warmed by the soup and thrilled by the sudden absence of precipitation, I set off for the Fair Green where folk were beginning to assemble, armed with flashlights, lanterns and flaming torches. 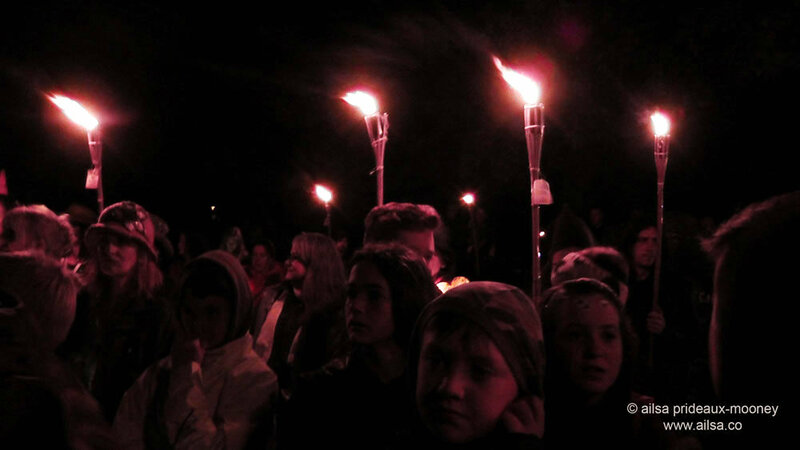 In the flickering light the crowd listened to tales of early Samhain, how it was a time to remember those who had passed and be thankful for the good things that had befallen them in the past year. Samhain was the Celtic New Year; they believed everything began in the dark and emerged into the light, just like a seed starts growing underground and reaches towards the daylight. There was also a report from the first formal archaeological dig at Tlachtga which took place this summer and has already made significant finds, including evidence that the existing monument, which likely dates back to the Iron Age, may have been built upon an even older monument from neolithic times. Local storyteller Gemma McGowan got the crowd warmed up, teaching a song to be used later in the procession; a song in honour of the goddess/druidess Tlachtga who lent her name to the hill. 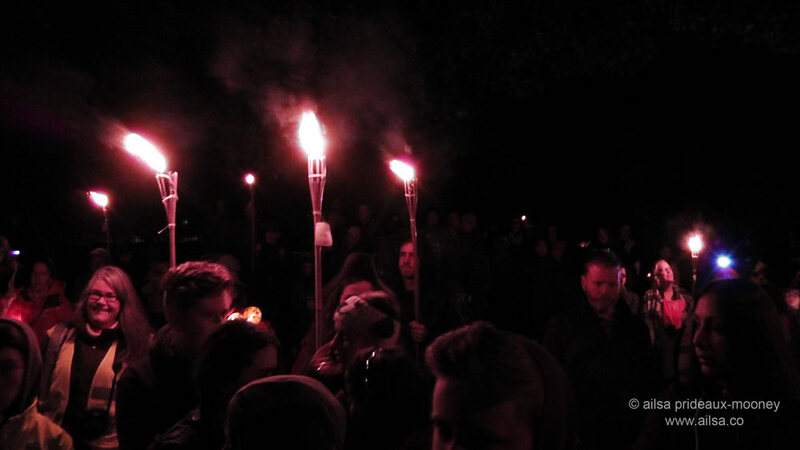 The procession from the Fair Green to Tlachtga was about a mile along a narrow country road with no street lights, but the way was lit by fire pits and Swedish fire torches that guttered and danced in the breeze. Residents gathered at the gateways of their houses to watch the procession and hand out chocolate and biscuits. 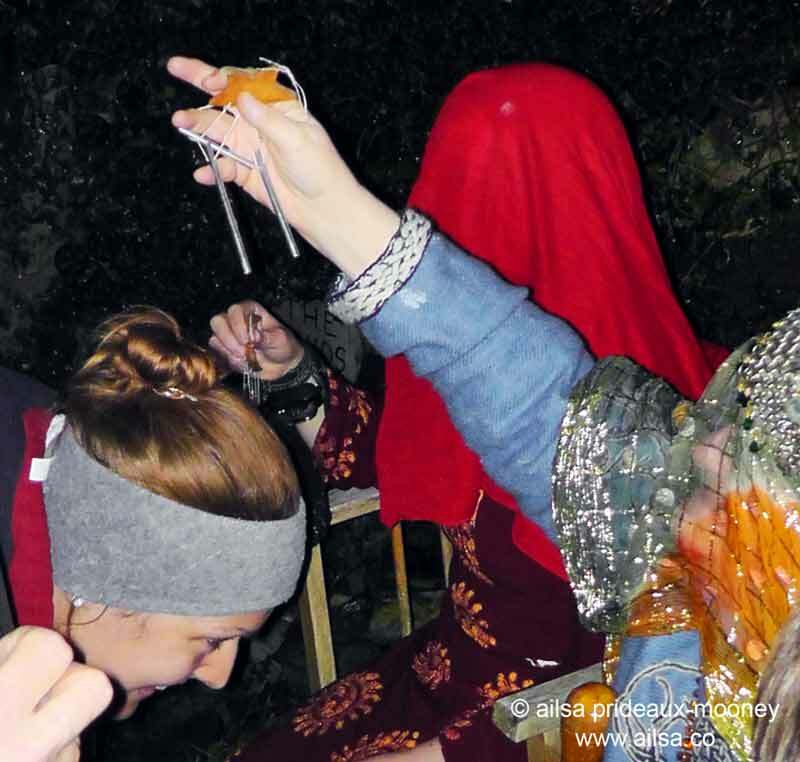 Along the way, three seers waited in the chill of night to offer festival-goers blessings for the New Year. A simple wooden stile guarded the entrance to this once-eminent site. Its plainness was perfectly lovely. and remembrances of loved ones who had passed. It was an intoxicating mix of good will, turf smoke, drum beats and rosy, flame-lit faces etched in deep relief. 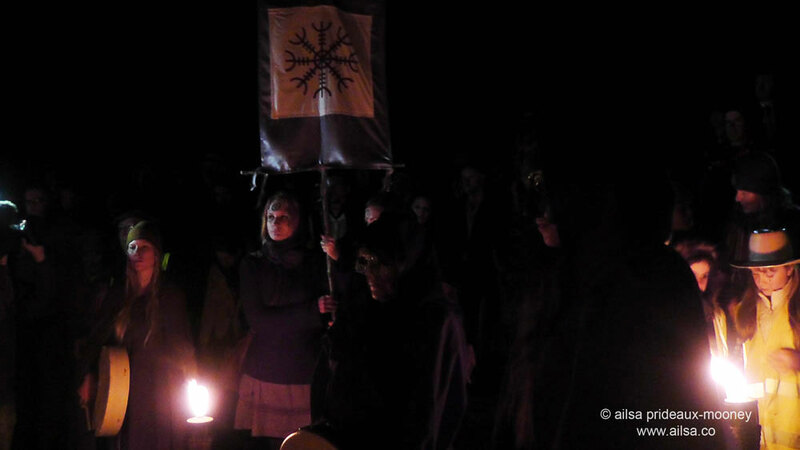 People from all corners of the world and of all ages joined in, raising their voices and echoing the ancients in celebration of their loved ones, their ancestors, the dark that precedes the light, and a long-forgotten goddess. 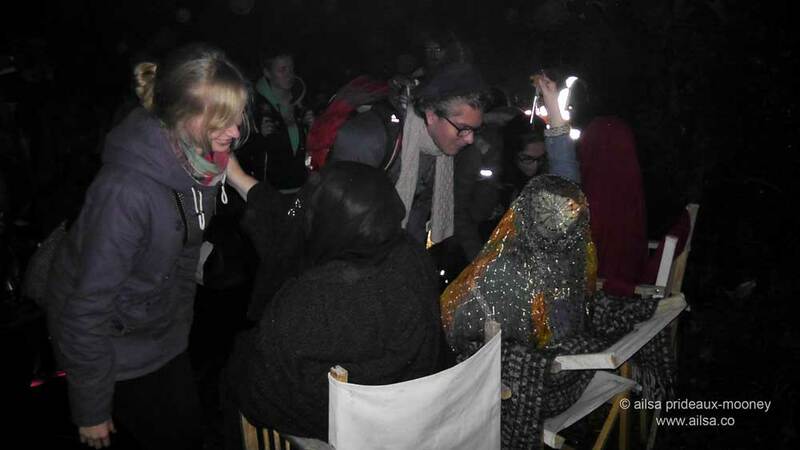 As the ceremonies drew to a close, warming cups of hot cider were passed around and sipped in the glint of firelight. 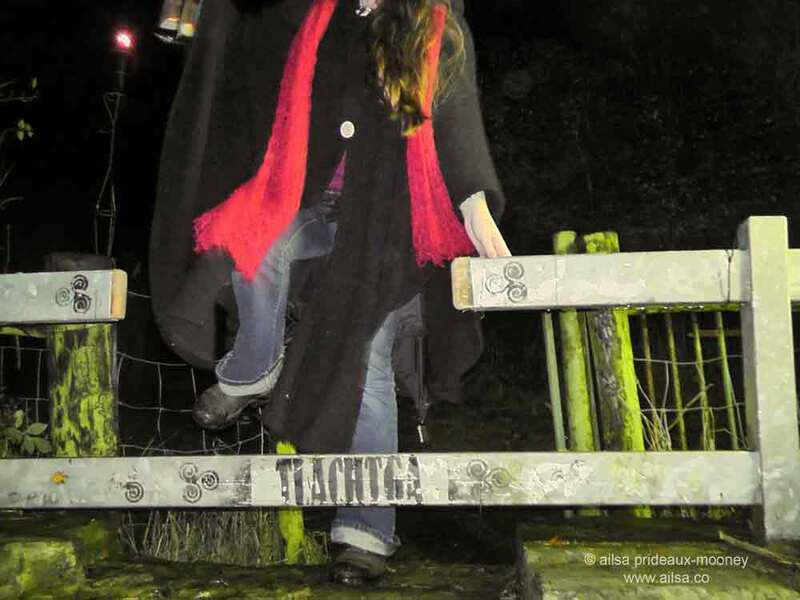 Tlachtga has long been associated with Samhain and fire ceremonies. A text called The History of Ireland, written by Geoffrey Keating in the 17th century, explains that all across Ireland fires were extinguished on Samhain. Druids would then gather at Tlachtga to light a massive ceremonial fire and embers from this fire were taken to the Hill of Tara to light another great fire there. Once these two fires were blazing, the rest of the fires in Ireland could be rekindled. Some believe they were to be rekindled with embers from one of the two original ceremonial fires, but that would have been logistically impossible. The fires on Tlachtga sputtered and went out; the crowd dispersed and we made our way back along the country lane to the Fair Green. As I got into the car a tiny drop of rain hit the windshield and glittered under the streetlights. In the frosted air and pale moonlight, I imagined Tlachtga holding back the stormy weather for just the right amount of time. 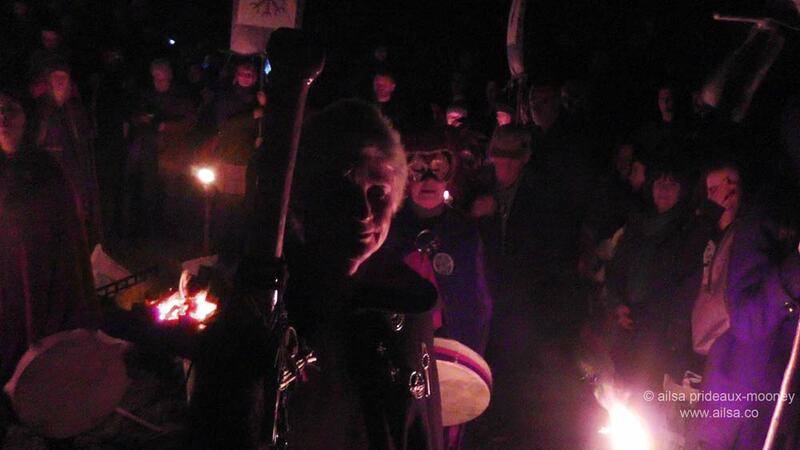 I’ll leave you with a little snippet of the Samhain Fire Festival on Tlachtga. This entry was posted in Europe, Ireland, Photography, Travel and tagged festivals, halloween, history, inspiration, mythology, photography, travel, writing. Bookmark the permalink. It was such a lovely gathering, Sylvia, and the hill itself is just gorgeous. Who needs to travel with postcards like this? Great read. Thanks. This is a wonderful post, Ailsa! Thanks for the history and the photos. What a wonderful evening for you. Glad I followed you. Great experience! I’m going to hold on to this. A group of friends and I hold an annual retreat on or near Samhain, and have for the past 17 years. This year we decided to do it in the summer and all kinds of WTF broke lose. Thanks for this beautiful explanation of the value of the season. Sounds like that was fun and interesting to all the senses. Thanks for sharing! Great post, Ailsa, I always struggled with the photography up there due to lack of light, but I’ll keep trying :-). I go to this every year as it’s close to where I live, however 2014 is the first time the weather put me off.